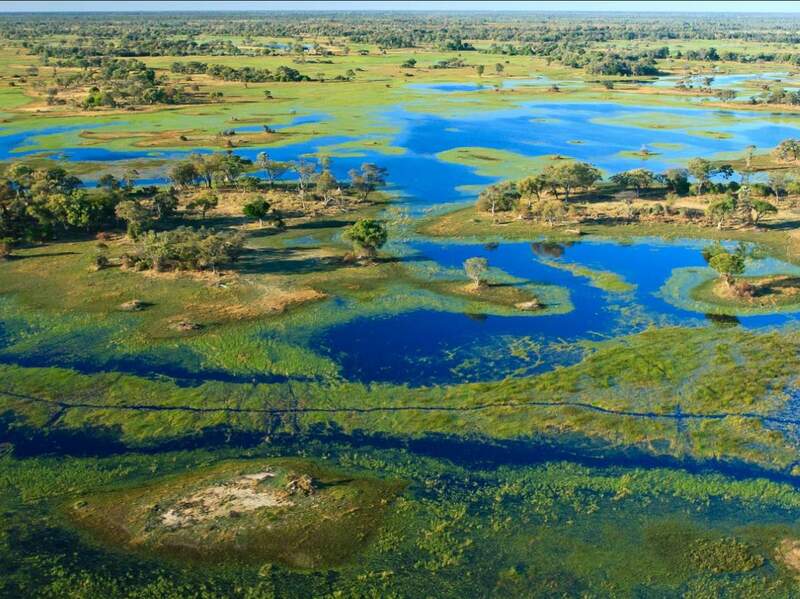 The Okavango Delta is on the UNESCO World Heritage List as well as one of the Seven Natural Wonders of Africa. There is less than 2 meters (6 feet 6 in) variation in height across the delta which leads to the formation of the myriad waterways that make up the delta. Each year, the Okavango River discharges approximately 11 cubic kilometers (1.1 × 1013 liters) of water into the delta. Most of this water is lost to transpiration by plants (60%) and by evaporation (36%) with only 2% percolating into the aquifer system with the remainder finally flowing into Lake Ngami. The water flows continuously into the delta and drains the summer (January to February) rainfall from the Angolan highlands. A surge, that flows 1200 kilometers in a month occurs between March and June. It is during this time that the Okavango Delta is at its largest, its area is almost 250 km to 150 km. Generally flat, with a height variation of less than two meters across its area, dry land in the delta is predominantly comprised of numerous small islands, formed when vegetation takes root on termite mounds. “Chief’s Island” the largest island in the delta, was formed by a fault line which uplifted an area over 70 km long and 15 km wide. Historically it was reserved as an exclusive hunting area for the chief. It now provides the core area for much of the resident wildlife when the waters rise. The Okavango Delta is an important wildlife area and it has been included on the UNESCO’s World Heritage List in 2014, as the 1000th site on the list. 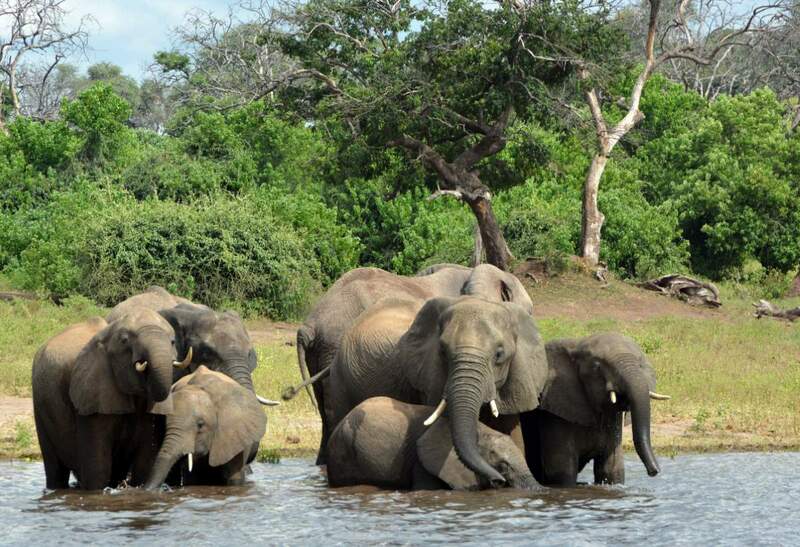 The Okavango Delta is one of the best places to see animals and birds in Africa. The area supports large concentrations of animals on both a permanent and seasonal basis. A myriad of species are found within the delta including African Bush Elephant, African Buffalo, Hippopotamus, Lechwe, Topi, Blue Wildebeest, Giraffe, Nile crocodile, Lion, Cheetah, Leopard, Brown Hyena, Spotted Hyena, Greater Kudu, Sable Antelope, Black Rhinoceros, White Rhinoceros, Plains Zebra, Warthog and Chacma Baboon. Notably, the endangered African Wild Dog still survives within the Okavango Delta and exhibits one of the richest pack densities in Africa. In addition to these large animals, the Okavango Delta also supports over 400 species of birds and 71 recorded species of fish including Tigerfish, Tilapia, and Catfish. Thanks to this wide variety of wildlife, the delta is now a popular tourist attraction. Okavango Delta is very green, but it’s not the result of a wet climate. The average annual rainfall is 450 mm. In the summer, December to February is a hot wet time span with daytime temperatures as high as 40°C, warm nights, and humidity levels fluctuating between 50% and 80%. During the autumn, from March to May, the temperature becomes far more comfortable with a maximum of 30°C during the day and mild to cool nights. The rains quickly dry up leading into the dry, cold winter months of June to August. Daytime temperatures at this time of year are mild to warm, but the temperature begins to fall after sunset. Nights can be surprisingly cold in the Delta, with temperatures barely above freezing. The spring, from September to November sees the heat and atmospheric pressure build up once more as the dry season slides into the rainy season. October is the most challenging month for visitors – daytime temperatures often push past 40°C and the dryness is only occasionally broken by a sudden cloudburst. Very few people live in the wetlands of the delta, with most living in towns and villages on the outskirts. The first official census of Ngamiland (North-West District of Botswana), derived by assembling and counting people at their headman’s village, revealed a population of 21 550 in 1904. This method was used again in 1911, 1921 and 1936. In the modern era, the population has risen dramatically since the first modern census of 1964 from 42 572 people then to 138 654 people in 2006. The Namibian government has presented plans to build a hydropower station in the Zambezi Region, which would regulate the Okavango’s flow to some extent. While proponents argue that the effect would be minimal, environmentalists argue that this project could destroy most of the rich animal and plant life in the Delta. Other threats include local human encroachment and regional extraction of water in both Angola and Namibia. The award-winning South African filmmaker and conservationist Rick Lomba (1950–1994) warned in the 1980s of the threat of cattle invasion to the area. His 1986 environmental documentary The End of Eden vividly portrays this and his lobbying on behalf of the Delta helped to preserve its integrity. Previous PostSlope Point, New ZealandNext PostProxima Centauri b: Did We Find Earth’s Cousin?